Fabinho’s statistics at centre-back vs. Brighton are outstanding…. Fabinho paraded his versatility with an admirable display at centre-back during Liverpool’s 1-0 win over Brighton. The Brazilian was again trusted as a make-shift defender having carried out the responsibility during Monday’s FA Cup defeat to Wolves. Jurgen Klopp’s summer signing looked unnerved by the physical threat of Glenn Murray and flourished as a distributor out from the back. He was notably granted the luxury of a perfect partner in Virgil van Dijk, who strode to another faultless performance following his absence at Molinuex. The former Monaco man registered a game-high five clearances and won all four of his aerial duels, per the Echo. Despite his bright impression, Fabinho will be hoping to reclaim his spot in midfield when Liverpool host Crystal Palace next Saturday. Joel Matip could prove defining in that respect after returning to training during the week following a six-week layoff with a fractured collarbone. Joe Gomez is meanwhile also close to completing his recovery from a matching spell on the sidelines with a fractured leg. 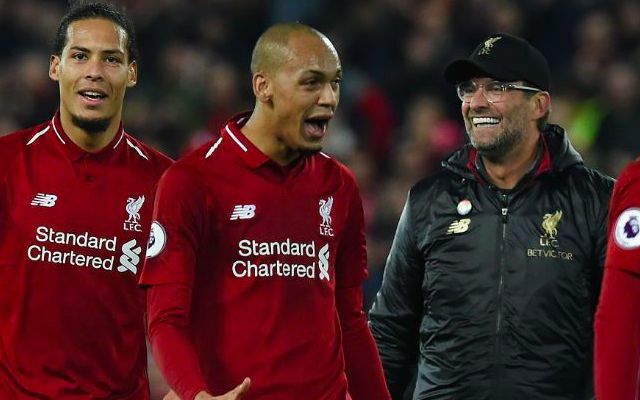 For Fabinho to excel in a less-familiar position is testament to not only his personal progression on Merseyside, but also his growing reliability and importance to Klopp’s side.